Bespoke living by ASH NYC? That's the exciting development that is currently happening in Providence, Rhode Island. 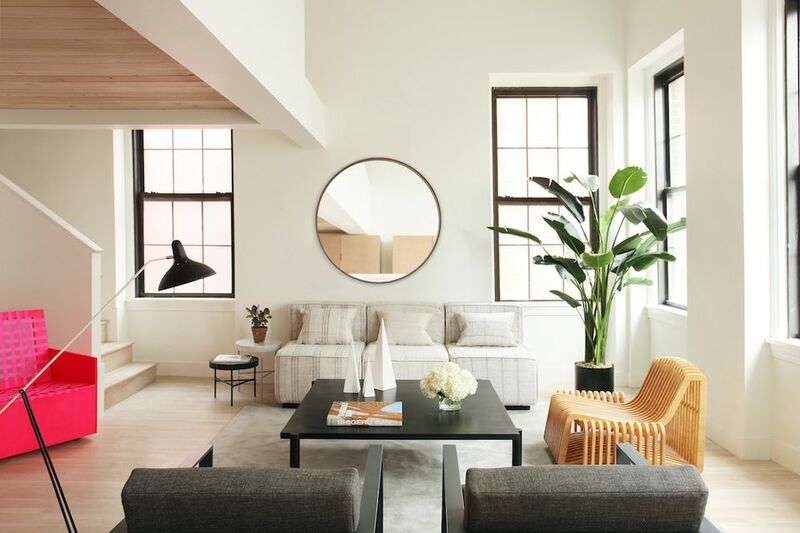 ASH NYC, the brand known for their one-of-a-kind designs, including their work at The Dean Hotel, is bringing custom living to ten apartments at 32 Custom House. Giving new life to a historic building, apartments have been re-imagined, going beyond their 19th century roots to become 21st century interiors that seamlessly blend luxury and minimalism in stunning living environments. Step into the living room, and you are introduced to the New York-based design and development company's signature clean and modern aesthetic. The apartments are an ode to minimalism - a style that has begun to define interior design in the 21st century. Particularly in cities, there's a desire for environments that allow the architecture and design of a space to shine through. Inside this minimalist home, modern furnishings are part of the open floor plan. Pieces promote lounging, relaxation and conversation. And they allow space to enjoy some of the architectural features of the apartment like the tall ceilings and wall of windows that bring in tons of natural light. The interior was designed to be clean and efficient, and it comes through in the furnishings that ASH NYC chose for the the space. The open plan living area connects directly to the home's dining room. Marrying the apartment's industrial frame with rustic materials, a large farmhouse table adds a midcentury-modern vibe to the space. Surrounded by wishbone chairs, the feeling of the dining area is cool and contemporary. No detail has been left unexplored in this modern living environment. The kitchen is filled with beautiful details that also help promote efficiency when prepping for dinner or that next big party. The home has many custom items and they can be found in the kitchen as well. Items like white oak European cabinets are hung high above the counters allows for ample space for prep and cooking space. The range hood has been concealed and sinks are undermount, so that they won't distract from the open plan layout of the interior. For prep, the counters are a durable Corian. And for appliances, a mix of Whirlpool stainless and matte black Brizo fittings add to the modern aesthetic. The bedroom offers a beautiful space to retreat. Something of particular importance when living in an urban environment. Furnishings have been kept to a minimum, while key pieces have been designed with statement elements in mind. A T side chair sits below the bedroom window. A few steps further, and the low platform bed offers an unexpected design element - a peek of blue at the bottom of the bed frame. To keep the serene vibe going, neutral pieces have been brought in to finish the space, including rugs, lighting and side tables. ASH NYC curates every part of a living environment, and that is true at 32 Custom House as well. Things are designed with a level or artistry in mind. The bathroom features the best in local and imported craftsmanship, with a mix of natural materials and custom details that set this bath apart. To set the stage, white marble floors and walls feel cool and luxurious in the space. For the vanities, Portuguese white oak was chosen. And for a bit of contrast, blackened steel mirrors and a medicine cabinet were brought in. In the shower, the bathroom sports subway tiles. A modern touch that is often pointed to as the height of luxury in today's bathrooms in urban environments. Even the fixtures have a bespoke quality to them. Fittings from Waterworks help the space feel like a spa, perfect for decompressing after a long day. This home is the perfect environment for the modern urban dweller who has a love for unique design. ASH NYC has married historic bones, age-old craftsmanship, and modern luxury in a space that, at the end of the day, is a spectacular environment to call home.